There are so many different thoughts on how much water to drink throughout a day. Eight cups? Two liters? How much is too much? Or too little? A recent U.S. National Health and Nutrition Survey (NHANES) revealed that water only accounts for 30 percent of all fluids Americans drink each day. It should be more. Especially when you are working out or training. In fact, studies now show that drinking water right before you exercise can give you an added boost of energy. Dehydration conversely can zap your strength by (2%), power (by 3%), and high-intensity endurance (by 10%) during a workout (NHANES). Fitness experts recommend drinking 8 ounces of water 30 minutes before you hit the gym. Then following-up with 16 ounces within 30 minutes of finishing. If you are actively training for a marathon or other high-intensity type event, you should drink even more water, as well as supplement with other sports and nutritional drinks to replace lost electrolytes. Foods with a high water content, mainly fruits and vegetables (like watermelon, cucumbers, and celery), can also contribute to your daily water intake. 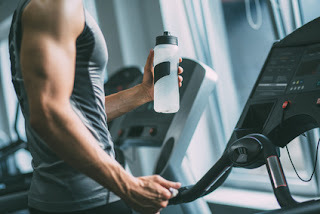 During these hot summer months, it is important to stay vigilant about hydration before and after your work out, especially if exercising outdoors.